For many of us, 2017 brought new challenges to our cultural, environmental, and economic well-being. Tough conversations ensued as people began to ask whether the ‘tendencies in the world’ were reflective of their values or were in need of change. 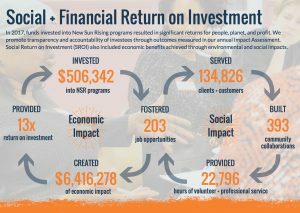 New Sun Rising responded with our most impactful year ever, supporting 156 non-profits and entrepreneurs who committed to use their power to make positive change in their communities. New Sun Rising builds vibrant communities through culture, sustainability, and opportunity. 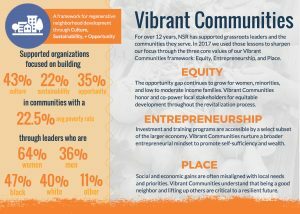 And, building upon a decade of lessons learned while helping grassroots leaders overcome their challenges, we published the Vibrant Communities framework to inspire others to join the movement. We adopted new core values of Equity, Entrepreneurship, and Place to focus our decision making. We strengthened our team to mirror the diversity we value in life and expertise, adding: Zaheen Hussain (Director of Sustainability), Jamie Johnson (Performance Improvement Manager), and Leigh Solomon Pugliano (Director of Opportunity) to join Daniel Stiker (Director of Culture + Operations) and myself. We also acquired the Millvale Moose to develop a Center for Community Vibrancy with a number of mission aligned partners. This 2017 Impact Report offers a glimpse into how New Sun Rising and our partners are building vibrant communities. Not simply dreaming about what’s possible, but by demonstrating that today, people are working hard to strengthen our culture, achieve sustainability, and create opportunity for all. We hope that you’ll join us. The Vibrant Communities Framework, informed by the shared values of New Sun Rising and our partners, guides our work and strives to bridge the opportunity gap. 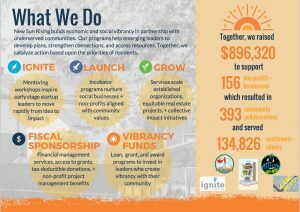 We believe that transformational change requires a commitment to engage + co-power local stakeholders, connect opportunity with community priorities, and to develop + activate a an entrepreneurial mindset. By quantifying and reporting on both the social and financial return on our investments, we lift up and value a range of contributions made by the individuals and communities we support.